On the one hand, I am happy to see this beautiful Hickok press, apparently still functioning, was not thrown into the trash heap. 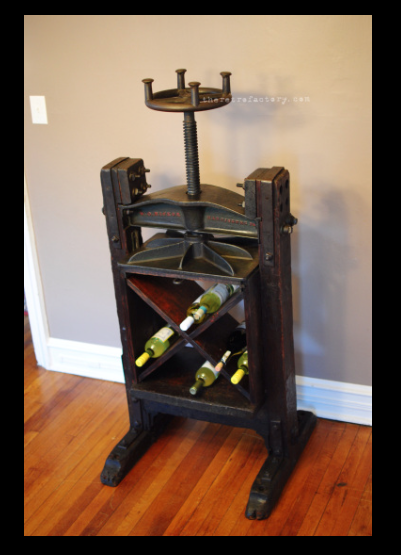 The repurposed aspects of this press appear easily reversible, simply by removing the wine box. However, many artifacts are totally destroyed by being “repurposed”, which is often code for sold in the interior design marketplace. The Retrofactory blurb dates this press to ca. 1860’s, which seems like a wild guess. Hickok started in 1844, there are very scanty records pre-1930. If this date is correct, this press is the earliest known transitional Hickok book press I’ve ever seen. I’d love to see the documentation. Transitional presses have metal and wood components. I used to sneer at them, so old fashioned! They develop wonderful creaking noises when gradually fully tightened, which gives some auditory feedback on the amount of compression. Look at the intelligent engineering of the thick cross-bracing on the upper platen — this is where rigidity is necessary in a press. The whole press is elegantly built for maximum lightness. The wood and iron elements interact complexly and organically. I think this helps prevent the press from backing off as much as all metal ones. The wood moves a bit, and the steel threads can settle in more parellel? The size of this press is very nice, the tightening wheel at a comfortable hand height. The wooden base is convenient to brace a foot against to keep the press from twisting in operation. One of my pet peeves are presses that are not attached to a workbench or floor. You know who you are! If you have to hold onto the press while tightening it, you loose at least 30% of the compressional power, and are much more likely to damage whatever you are pressing. Looking at the image of the press above, I bet a lot of shoes have braced themselves against it, though it was likely also bolted to the floor at some point, note the small slots at the ends of the feet. Given the distinctive shape of the four knobs on top of the wheel, there must have been a specialized press pin designed to fit them. It irks me to see this beautiful press being removed from the functional bookbinding world, and co-opted into the interior design world, where its only value is to feed the appetite of the 1%. An unnecessary and silly wine storage rack for $3450.00. More broadly, is sad when our collective culture values one of a limited number of remaining functioning 19th century Hickok presses more as a decorative object than functional one. Tools have become so invisible that we no longer even notice them, or value them. Even though the W. O. Hickok Manufacturing Company is still in business, they have transitioned into primarily a job machining shop due to lack of demand for bookbinding equipment. Their web site mentions they still make presses and job backers on special order. The genuine Hickok 001/2 is my favorite press for general bookbinding and book conservation, much nicer than the copies of it. Please support them! SU has one in Preservation. Doesn’t get used much, but was always nice to look at. Let me know if you want to sell it! This is the Hickok Type 00. It was indeed offered in their 1869 Catalogue (copy owned by Tim James, formerly loaned to the American Bookbinders’ Museum, ex-U.S. Patent Office, Library, of Congress duplicate discard). However, it was still offered in their Catalogue No. 93 in the late 1920s or early 1930s (my copy, landscape format with blue paper cover; the San Francisco Public Library has an almost identical copy of a slightly earlier edition with a 1920s copyright date). It was no longer shown in Circular B 479, which I would guess on stylistic grounds to be post-WWII and pre-1970s. The 1869 catalogue says that the lever was wood and five feet long; the cut in the circa 1930 catalogue shows the lever, basically square-sectioned with a rounded and slightly tapered handle end about two feet long and a couple of notches at the other end to engage with the press. And the 1869 catalogue says that “They are painted in a beautiful manner, and are just what every binder wants,,,” The more things change, the more they stay the same. Thanks again, Tom. It would be a real service to the field if Tim would scan this catalog and post it on the American Bookbinders’ Museum site. I have the same press my father got back in the 70’s. For years we have been using it as a TV stand. The same exact one, I wish I could send a picture. Cool. 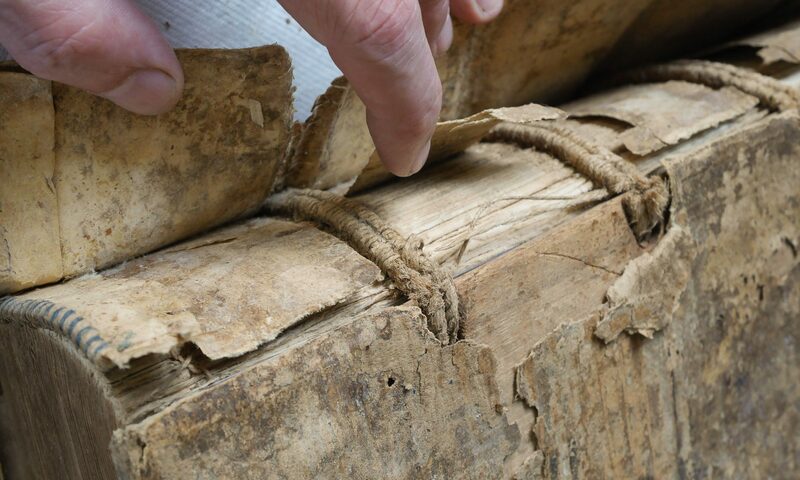 Hope you sell it back to a bookbinder when you are finished with it!